Plane makes emergency landing at Ben Gurion Airport just prior to start of Jewish New Year. Arab MK: People worried, but we're all okay. 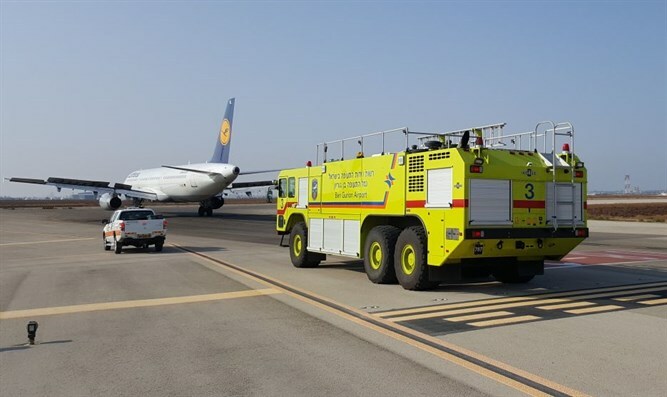 A Lufthansa plane on Wednesday afternoon made an emergency landing at Tel Aviv's Ben Gurion Airport, after it discovered a problem with one of its engines. Israel's Airports Authority said the Airbus A321 carried 180 passengers, and one of its engines ceased functioning shortly after takeoff. MK Ahmad Tibi (Joint Arab List), who was on the plane, said that the experience of disembarking was not a simple one. "When we took off, we heard a noise from the plane's right side," he said. "Right afterwards, the pilot turned the plane around and said there was a technical issue." "After we landed, we saw dozens of firefighters and ambulances. No one panicked on the plane, but people were worried. I'm an optimistic person, so I see the bright side. Yes, this is a good start to the year, because our plane could have crashed. All 180 passengers are fine, and that's what's important."